Note to Readers: Life in Chicago articles are generally "family friendly." This story, however, contains some mild profanity. The same could be said of Sam Wolfson. 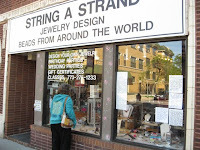 Wolfson is co-owner of String-A-Strand, a bead store in Lincoln Square. These days, a passerby to the store would see something unusual taped to the inside of the front window: Seven pieces of paper— two with String-a-Strand letterhead, the rest plain white— with black, hand-written text scrawled across them. IF THESE PARKING METERS ISN’T FRAUD & EXTORTION ON THE People & THE CITY O [sic] CHICAGO WHAT IS. FRAUD & EXTORATION [sic] IS A CRIME SO THIS LEASE SHOULD Be VOIDED. Mayor DALEY-STROGER AND EVERY POLITICIAN WHO ARE INVOLVED IN THIS SHOULD BE IMPEACHED. NOT A SINGLE MEMBER OF THE CITY COUNCIL STOOD UP FOR THE People OF CHICAGO & SAID THIS IS WRONG. WHY SHOULD THEY WHEN THERE [sic] HANDS ARE IN OUR Pockets. We MUST VOTE EVERY ONE OUT OF OFFICE. THESE ARE SOME OF THE WORST POLITICIANS IN THE Country. No Concern For THe PeopLe OF CHICAGO. OnLy for THe MONeY They CAN Pocket. WE MUST FINALLY STAND UP & SAY NO MORE YOU B_ _ _ _ _ DS [sic]. STOP Ripping US OFF THERE MUST BE SOME HONEST POLITICANS WHO WILL VOID THIS PARKING LEASE FRAUD. THAT’S WHAT IT IS FRAUD. VOTE THE STROGERS & DALEYS OUT OF OFFICE. ENOUGH IS ENOUGH. RESCIND THE SALES TAX BACK TO 8.5%. VOTE THESE BUMS OUT OF OFFICE FIX THE POT HOLES STOP RAISING TAXS [sic] THAT’S ALL THESE POLITICIANS DO. WAKE up CHICAGO We CAN’T Be THAT STUPID TO PUT THESE CORRUPT POLITICIANS BACK IN OFFICE. Especially DALeY & STROGER WHO SOLD THE PEOPLE OF CHICAGO DOWN THe TOILeT SeLLING THE PARKING MeTers & RAISING THE TAX To THe LARGEST IN THE CounTry. FRAUD & CorrupTION THAT’S ALL CITY HALL IS. ITS TIME TO VoTe THe IDIOTS OUT. HOW BAD IS THIS CORRUPTION THE CEO OF THIS PARKING METERS RIP OFF ON THE people OF CHICAGO. IS MAYOR DALEYS BROTHER. WHAT CROOKS. WHY WON’T THE Newspapers & TV REPORT THIS. LET ME GET THIS STRAIGHT. MAYOR DALeY SOLD THE MeTeRS TO A PRIVATE CO. SO WHY ARE CITY EMPLOYEES WRITING TickeTs ESpecIALLY THE CHICAGO POLIce. DID THe MAYOR SeLL THE POLICe DepT. ALSO. WHO WRITeS THE TICKETS & WHERE IS THE MoNey GOING SOUNDS LIKE TYPICAL CHICAGO CORRUPTION. It took Wolfson only a week to write this out. Sam Wolfson, a delicately punchy man of 72 (“21,” he quipped, when first asked his age), has washed-out gray hair, slightly wrinkled skin, and a goatee. He speaks in a raspy voice and has a tendency to gesticulate with his hands when he talks about this. The this, of course, is the privatization of the city’s parking meters. Last September, Chicago’s City Council approved a plan to lease the 36,000 meters to a private operator for 75 years in exchange for $1.15 billion. Mayor Daley has argued that this was an important move to bring the cash-strapped city some income. Just about everyone else seems to feel differently. Parking rates have increased, in some cases dramatically, and erroneous tickets have been issued, due to broken (or full) meters or inaccurate signage. There’s been public outcry, too, over the process leading to the decision, which was opaque to the public. As a result, drivers have boycotted feeding meters, boycotted parking at meters, and even resorted to vandalism. One man— who, ironically, doesn’t drive— put up signs. Wolfson, who grew up on the West Side of Chicago, has owned his own business ever since he was 18. First, he worked concessions for a guy at Wrigley Field and Comiskey Park. Eventually, he bought the guy out, and he continued with the work until 1971. Then he got into the bead business. He’s even opening a new place in Lincoln Park, a gourmet hot dog restaurant. Once it gets approval from the Department of Public Health, his son will manage it. Though Wilson doesn’t drive to work— his wife drops him off, or he’ll take the bus— he’s still felt the brunt of the parking meter changes. “My wife and me went to Wildfire last week for dinner,” he recalls. “Three dollars for an hour and 25 minutes. Now, Wildfire is crowded; we like our steaks. We go in there, takes you a half an hour to get our food. A-ga-a-ga-a-ga-a-he”— he motions with his hands, as if scarfing down food. As for more-recent times, “Every governor we had the last— I mean, Ryan’s in jail, and BLA-go-vich [his pronunciation] is selling the seats. But Daley’s getting away with this crap. All of his henchmen get caught, but Daley doesn’t know anything about it. He’s so crooked, it’s uncanny. 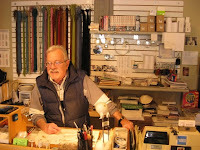 Wolfson has worked in beads for the last 39 years, manning the store at its current location for the past seven. He says that with the meter privatization, he’s seen ticket-writers out on the block in front of his store at 8 a.m., when meter hours come into effect. He’s even seen three ticket-writers at once. Right now, like the archetypal Cubs fan, Wolfson’s looking ahead to next year. If Wolfson and his signs can build up the momentum, we may just see a revolution. "HUMAN stories from around the Windy City." I love the *humanity* you bring to your observations, David. Wonderful posts! Thank you.